This page only includes major features and changes. We also post monthly updates about smaller changes. 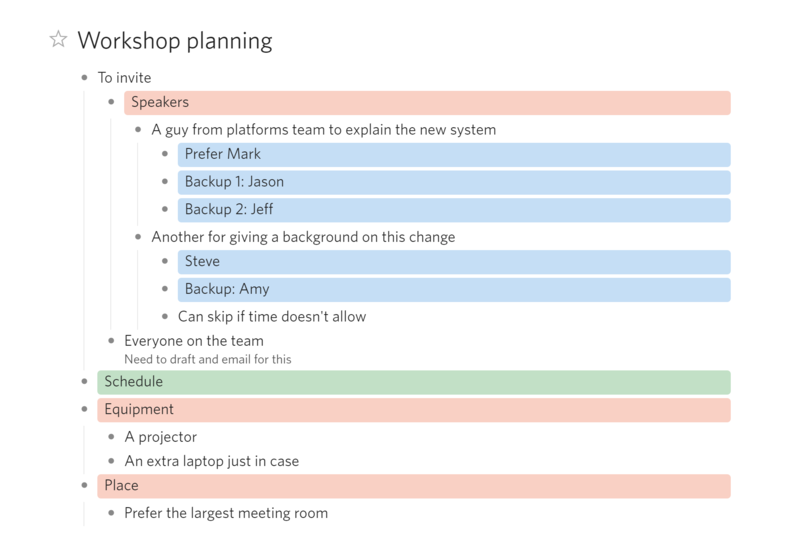 To vote for the features you want, check out our public Trello roadmap. To suggest new features, start a topic on our forum. See your document as a mind map! Recurring dates makes managing repeating tasks easy. You can see your invoices in the account page now. Developers can now pull data from and make changes to their Dynalist. Easily clip web pages and selected text to your Dynalist inbox, with customizable formats. Get it here! Add custom CSS that works on all platforms. View past changes to your document and who made them. See a screenshot here. Option to sort tags alphabetically rather than by occurrences in the tag pane. With the mobile app, you can now share any text or link to your Dynalist inbox. Rename tags in bulk from the tag pane. Get 50% off if you are a student in any institution. Dynalist now supports real-time sync, allowing collaborators to work together more efficiently. Set an item as inbox and capture stuff with a single shortcut from everywhere in your Dynalist. When no search is entered, the file finder now shows the 5 most recently accessed documents for easy switching. The one place to see and search for all your tags. You can have the option to auto-complete tags globally rather than from the same document. Syncing dates in Dynalist to your Google Calendar. Read the announcement here. Adding colors to your lists. See a screenshot here. Allows you to move items fast and without leaving the current context. Our Windows desktop app that supports offline editing. The keyboard will never pop up in this mode. Good for quickly checking things. Discuss new features, reports bugs, and help each other out at talk.dynalist.io. A theme that&apos;s easier on the eyes. See a screenshot here. Allows customizing most in-app keyboard shortcuts. Allows inserting dates and filtering items by date range. Jump to any bookmark with a few keystrokes. Drag and drop or paste a file to upload to Dynalist. The monthly quota is 1 GB. Rather than completely hiding the note section, you can now show only the first line. Allows hiding notes when you don&apos;t need to see them. Convert normal lists to numbered lists. Good for instruction steps, recipes, and lots of other things. Drag and drop or paste an image to upload to Dynalist. The monthly quota is 1 GB. Documents, items, and searches can now be bookmarked. Bookmarks can be accessed in the "Bookmarks" pane on the left side. We used to only backup a plain text version in daily backups. Now an OPML version will also be created. Allow searching for a keyword in all documents. Suggest tags from the same document so you don&apos;t have to type the whole thing. Fewer typos too. Your last zoom in a document will be remembered when you switch between documents. When you come back, your last zoom will be restored. Search used to support only plain text. Now you can search for items that exactly match your query, items that match either one of your keywords, or items that does not contain a keyword. 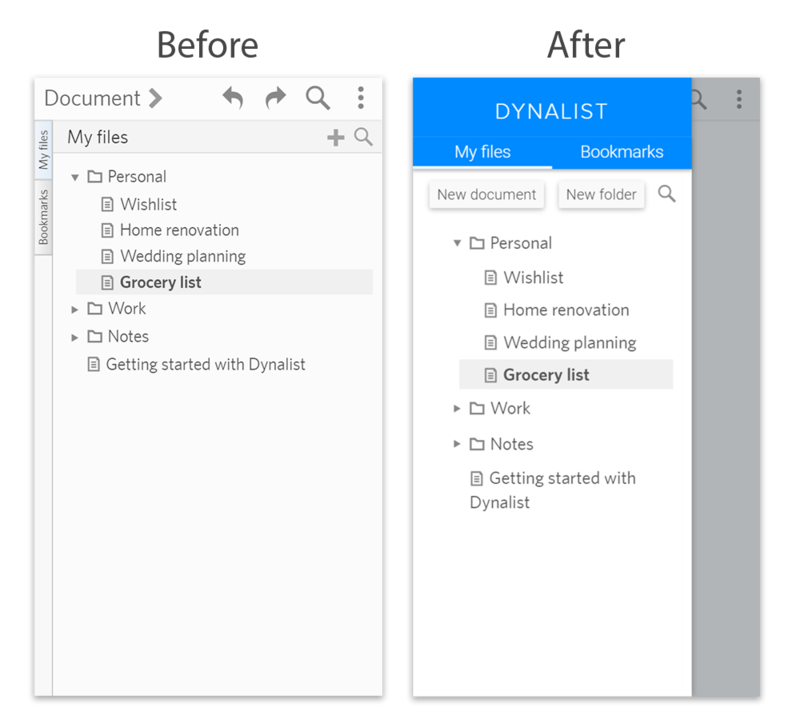 In addition to Dropbox, the daily backup feature in Dynalist Pro works for Google Drive as well. You can choose to hide your checked items and show them at any time. Add additional details in the note section of an item like links and phone numbers. Supports plain text, formatted, and OPML. Now you can work with an item on your phone! Only contains Dropbox daily backup for now. Sends a backup for your entire workspace to your Dropbox every day. We have new domain name and a new landing page. The switch was smooth. 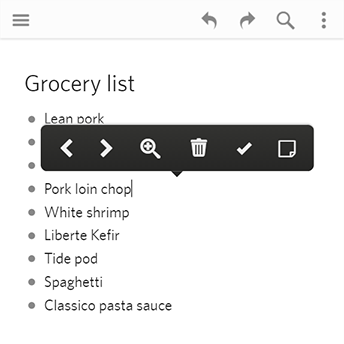 Any list can be converted into a checklist and checkboxes will appear before each item. Tagging allows flexible grouping of items and fast filtering. With markdown syntax, you can now insert inline images. The image can be previewed by hovering the image icon. Use $$ to surround your equations and they&apos;ll render in LaTeX. Includes bold, italics, inline code, and named link.